List of Marathi newspapers and Marathi news sites offers articles on politics, business, sports, jobs, education, lifestyles, healthcare, and more. Most widely read Marathi language newspaper. Read Lok Sabha Elections News. One of the most popular Marathi newspapers. Marathi language newspaper based in Pune, Maharashtra. Marathi newspaper published in Mumbai, India. Marathi daily newspaper of Dainik Bhaskar Group. Marathi language newspaper. Regional editions of the Pudhari published from Mumbai, Pune, Ahmadnagar, Belgaum, Kolhapur, Sangli, Satara, Solapur, Ratnagiri, Sindhudurg, and Goa. Marathi-language newspaper published in Maharashtra, India. Marathi-language newspaper based in Mumbai. Marathi-language daily newspaper published from Beed. Marathi daily newspaper published in Beed, Maharashtra. 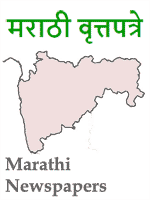 Marathi-language newspaper based in Latur, Maharashtra. Ekmat published by the Amit Publications. Marathi language newspaper published from Solapur. English-language daily newspaper published in Pune, India. Marathi language newspaper based in Satara, India. Maharashtra's daily broadsheet newspaper published by Indian National Press. Marathi newspaper in Marathwada region of Maharashtra. Marathi daily newspaper based in Mumbai, Maharashtra.